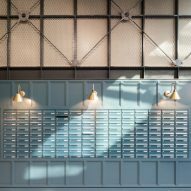 Tigg Coll Architects has renovated a student accommodation building in London's Kings Cross, with interiors based on the area's railway heritage. 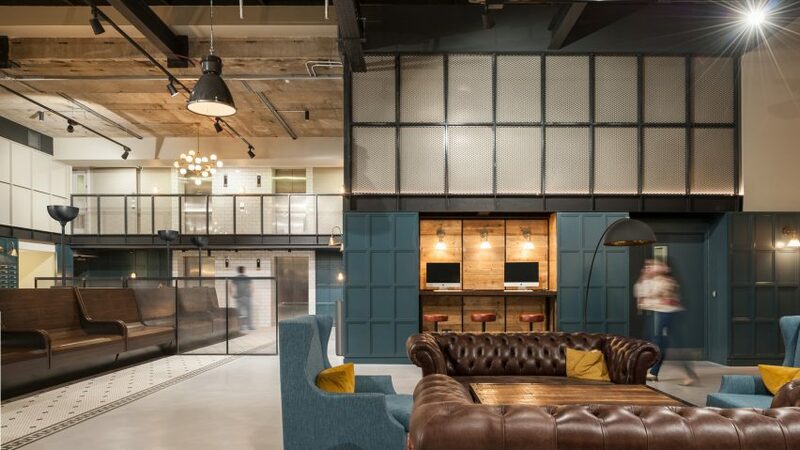 The Chapter student accommodation building is located near the Kings Cross St Pancras train station. The two 15-storey towers were previously used as headquarters by Natwest, before being converted into student living in 2007. 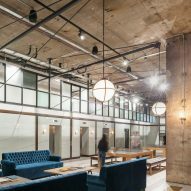 Inside the building, the architects have returned the arrival hall to its original concrete and steel construction, with booth-style seating areas designed to resemble train carriages. Benches are upholstered in geometric-patterned material that also recalls railway seating. 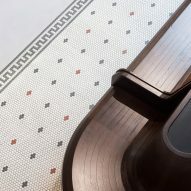 Walls feature sections of ceramic tiling, and areas of the floor are covered in mosaics. 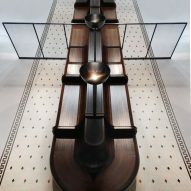 A bespoke curved wooden bench offers a place for visitors to wait. 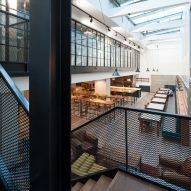 "The design for the refurbishment was conceived from the contextual history and local character of the area, drawing on the industrial heritage and language of the iconic Kings Cross Station," said Tigg Coll Architects. 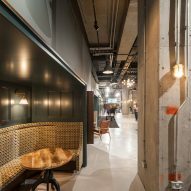 The studio has allowed more daylight into the lobby by opening up existing mezzanines and adding glazed partitions in steel frames. 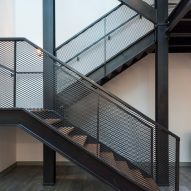 A new steel and wood staircase with mesh balustrades has been inserted, while the metal elements of the interiors are repeated in cantilevered lighting. 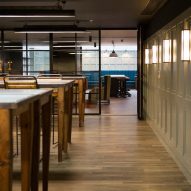 The firm has also created more room for socialising by moving security barriers and the reception desk further into the building. 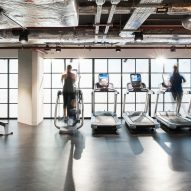 The existing gym has also been relocated on to an upper level to give visitors views through the expansive windows. 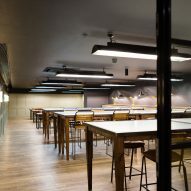 Further additions to the building include a screening room and both private and communal study areas furnished with long shared tables and stools. 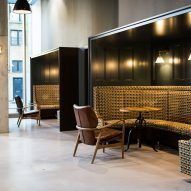 Elsewhere, strategically placed sofas and rugs in the building's public areas offer places to meet and relax. 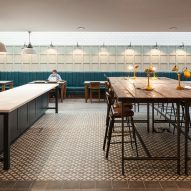 A communal kitchen has space for students to make drinks and snacks. Dezeen has covered several student housing projects that are a far cry from the typical cramped halls of residence. US firm Studio Gang's complex for the University of Chicago features glass and white concrete towers, while BIG took a less conventional approach, stacking shipping containers on a floating platform in Copenhagen's harbour to create buoyant student homes.